Review: 'Arctic' Is A Harrowing, Urgent Adventure Tale No flashbacks, no dream sequences. Just a raw, harsh tale about the practical concerns of minute-by-minute survival in a frozen wasteland. "Let it go/Let it go..." In Arctic, Mads Mikkelsen gets stranded without a map; but it's the cold that really bothers him, anyway. He's been there for weeks. Since the plane crash that stranded him somewhere near the North Pole, the protagonist of Arctic has had time to carve a giant "SOS" in the snow, turn the damaged fuselage into a sort of cabin, and set up an semi-automatic ice-fishing apparatus that yields fresh protein on a regular basis. 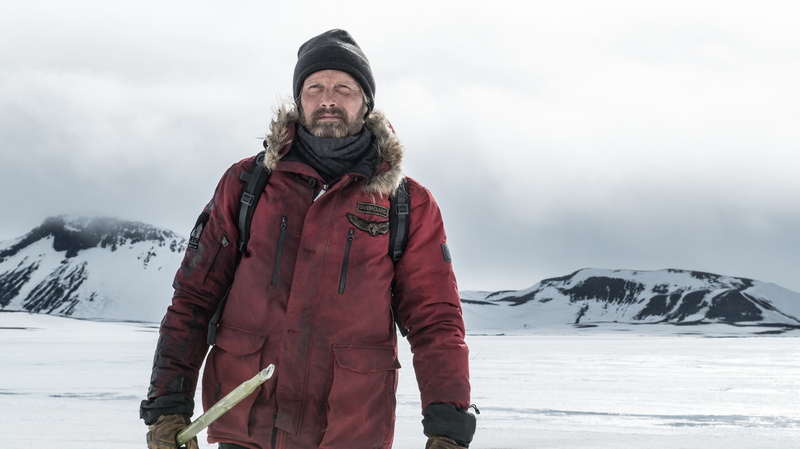 The man whose heavy winter jacket identifies him as Overgard (Mads Mikkelsen) knows that staying in place is safer than trying to walk to — where? He doesn't even have a map. Overgard's tiny world expands because of a failed rescue. A helicopter hovers over his camp, promising salvation. But then it's caught by a powerful downdraft that smashes it to the ground. Inside are a dead pilot and a badly injured co-pilot (Maria Thelma Smaradottir). Overgard pulls the unnamed woman from the wreckage and staples shut a nasty gash in her belly. The chopper contains bounty: fuel, a lighter and instant ramen. There's also a map and a sled, making possible the journey Overgard is still reluctant to undertake. It's only the deteriorating health of his semi-comatose new companion that convinces the polar castaway to begin the trudge to an outpost he spots on the topographical chart. Filmed in Iceland, Arctic is an odd choice for a first feature from director and co-writer Joe Penna, an L.A.-based Brazilian who came to YouTube prominence as MysteryGuitarMan. The movie is not based on actual events, lacks the comic elements of Penna's videos, and has no connection with the ecology of the filmmaker's youth. But a survival story set in, say, the Amazon would flower with threats. Here, there's only the cold — plus the growling polar bear composited into one tense scene. The simple yet intense scenario makes Arctic a taut, cohesive exercise for Penna and editor and co-writer Ryan Morrison. It's also a fine showcase for Mikkelsen, playing a man who's resourceful but no more heroic than he needs to be. Overgard struggles to save the wounded woman who has literally fallen into his camp, because that's the right thing to do. But he also recognizes that helping her gives his existence a higher sense of purpose. Like such fictional precursors as All Is Lost, as well as the documentary/docudrama Touching the Void, Arctic emphasizes practical concerns, naturalistic details, and minute-to-minute actions. The movie's exemplary sequence is one in which Overgard repeatedly tries to drag the woman up a snowy slope that's steeper than it appeared on the map. Raw and harsh as it is, the movie is squeamish about some details of human existence. Caring for a near-paralyzed person is a lot messier than Penna acknowledges, and wet pants can be fatal in sub-zero temperatures. (One useful item Overgard doesn't pull from the wrecked chopper is a pack of adult diapers.) By sanitizing such details, Arctic admits that it is, despite all the ice and blood, just an adventure flick.